I cannot even begin to tell you how excited I was the other day when I found a whole bunch of vintage Mummenschanz videos from The Muppet Show - these guys were the bomb! 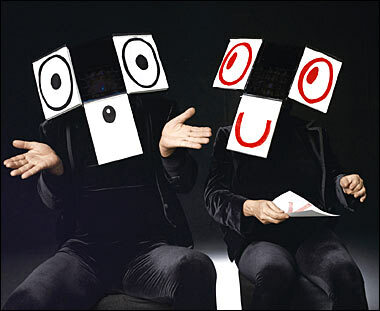 Mummenschanz was a trio of Swiss mimes/puppeteers who made several TV appearances in the 70s. However, they were not like any mimes you ever saw before - least of which the annoying ones with white faces. Instead, they wore masks made out of moldable clay or removal parts or full body suits that allowed them to move around as various objects on stage. I can't even begin to describe how weirdly wonderful and creative them were - and while I admit being a little scared of them as a kid, I also found them fascinating. The name comes from the German word for mime, which is mummer. Two guys and a gal originally made up Mummenschanz. Bernie Schürch, Andres Bossard and Floriana Frassetto formed the group in 1972. They toured the world in the mid-70s and played Broadway for three years. Bossard passed away in 1992 and today there are four members, including Schürch and Frassetto. They were responsible for the shadow imagery of nominated movie titles during the 2007 Academy Awards ceremony. Take a look at some of the videos below - they certainly took me back and I can honestly say I've yet to see anything like Mummenschanz for quite a while, at least on national television. Back in the 70s, you certainly had to be talented and creative to make it on TV. Does anyone else remember these guys? Yep, I felt the same way about them - fascinated and creeped out at the same time. Thanks for turning me onto these guys, Pam! I actually brought up your blog and this post last night in a class when we somehow got on the topic of mimes. My study partner was not only totally familar with Mummenschanz but he also told me his old girlfriend took mime in high school. Yes, she had a high school that taught mime and she even competed in a state tournament for mimes! Anyway, that's what he said! :) I do hope it's true though... How odd! Wow, talk about a blast from the past!! I saw these guys twice in the 1980s, I forced my parents to take me the first time somewhere in downtown LA, then miraculously they also appears at the community college only 3 blocks from my house! Probably the coolest thing ever to hit El Camino College. Amanda - sort of like clown college? I think there really is such a thing...and thanks for name dropping my blog! Matt - I seriously admire that you got to see them in person! I would love to see a show and I think they're waaaaay more talented and unique than the much overrated Blue Man Group that's been running forever in Boston. I used to try describing my childhood memories of these guys to people and they'd look at me like I was insane. Thanks for posting proof they really existed!